According to the U.S. Bureau of Labor Statistics (BLS), jobs for medical office administration and assistants are projected to grow 29% over the next decade, over three times the national average. Medical office administrators interact with patients, organize sensitive records, and help patients and family members navigate insurance claims and billing. Graduates can help families through medical emergencies and chronic illness as office administrators by completing a medical office administration certification online. 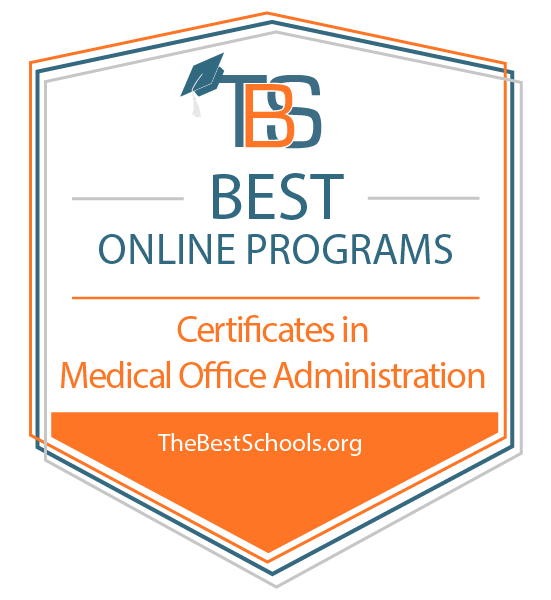 What Are the Best Online Certificate in Medical Office Administration Programs? Online Certificate in Medical Office Administration Degree Program Ranking Guidelines: We selected the degree programs based on the quality of program and range of courses provided, as well as school awards, rankings, and reputation. Originally founded in 1961, Pitt Community College now offers classes both online and on campus in Winterville, North Carolina. Students at PCC can pursue associate degrees and certificates in the arts, sciences, business, and health. PCC offers a medical office administration certificate online that prepares students to work in areas such as medical administration, billing, medical auditing, and insurance. The medical office administration program at PCC covers skills such as diagnosis coding, billing and filing software, and patient privacy laws and regulations. The curriculum includes courses in word processing, data entry, medical terminology, keyboarding, professional development, and healthcare customer relations. The certificate requires 17 core semester hours of coursework. Pitt Community College is regionally accredited by the Southern Association of Colleges and Schools, Commission on Colleges (SACSCOC). Johnston Community College has offered associate degrees, certificates, and diploma programs since 1969. Johnston's sprawling campus in Smithfield, North Carolina features a 16-acre arboretum, and one of the satellite campuses maintains a 2,800-acre wildlife preserve. Johnston serves around 15,000 students every year, both online and on campus. Johnston offers a 44-credit medical office administration diploma that students can complete completely online. Learners may choose to enroll on a full-time or part-time basis. The curriculum includes classes in medical terminology, keyboarding, diagnostic and procedure coding, and records management. Students can also pursue a degree in medical office administration. Johnston Community College is regionally accredited by the Southern Association of Colleges and Schools Commission on Colleges (SACSCOC). With two campuses in Roxboro and Yanceyville, North Carolina, Piedmont Community College serves students across Person and Caswell counties. With the growth of its online programs, Piedmont also educates learners from across the country. Piedmont offers degrees, diplomas, and certificates in a variety of fields, including business studies, public health, natural science, and manufacturing. Students can earn certificates in medical office administration and electronic health records entirely online. These online medical office administration certifications each require 16 credits, with courses in medical terminology, medical office transcription, and keyboarding. The electronic health records certification requires an additional course. Students can complete both certifications as part of a medical office administration associate degree, which consists of 65-67 credits and includes general education courses. Piedmont Community College is regionally accredited by the Southern Association of Colleges and Schools Commission on Colleges (SACSCOC). Located about an hour northwest of Greensboro, North Carolina, Surry Community College serves students from all over Surry and Yadkin counties. Distance learners can enroll in Surry's programs from anywhere in the country. Surry offers courses in 48 different areas of study, including public service, law enforcement, fire and rescue, and business and computer technologies. The school awards associate degrees, certificates, and diplomas. Surry's 17-credit medical office administration certificate online generally takes about two semesters to complete. Students take courses in keyboarding, records management, office editing, text entry and formatting, and medical terminology. Graduates often work in medical and dental offices, hospitals, and medical supply companies. Craven Community College has served students in North Carolina for over 50 years. Craven offers fully-online and hybrid programs, including degree, certificate, and diploma options. The school focuses on workforce development and concrete skills that students can use to find long-term employment. Craven offers both a diploma and certificate in medical office administration that students can complete almost entirely online. The curriculum emphasizes office skills, keyboarding, text entry, spreadsheets, and general management. Student can also specialize their certificate in areas such as medical billing and coding or patient services. Each certificate requires 14-19 credits. Online students must complete a special online orientation prior to the start of classes. Craven Community College is regionally accredited by the Southern Association of Colleges and Schools Commission on Colleges (SACSCOC). Lenoir Community College offers extensive online programs in areas such as applied science, aviation management, and accounting. Lenoir maintains an "open-door" admissions policy, which encourages anyone over 8 who may benefit from post-secondary education to enroll in courses. The school also serves dual-enrollment high school students. Students can earn a certificate in medical billing, coding, and insurance entirely online. The 15-credit certificate includes courses in medical office terminology, medical insurance and billing, and procedural and diagnostic coding. The program prepares learners to find entry-level jobs in medical offices, hospitals, and other healthcare facilities. Gaston College focuses on affordability, student success, and program completion. The school offers over 170 programs of study, including 81 unique certificates. With more than 200 distance learning courses, students can complete several programs entirely online. Gaston also promotes workforce development and continuing education. The medical billing and coding online certificate at Gaston consists of 16 required credits. Students can complete the program over one academic year. The curriculum includes courses in medical terms, procedural and diagnostic coding, medical legal issues, and coding for billing and insurance. Students begin this program during the fall semester and complete it at the end of the following summer term. Learners take just two classes per term. Gaston College is regionally accredited by the Southern Association of Colleges and Schools Commission on Colleges (SACSCOC). Located in the center of North Carolina, Randolph Community College offers distance learning courses in accounting, education, English, computer science, medical technology, and several other fields. Despite starting with just 75 students in 1962, the college has grown to serve thousands of students across many academic programs. Students at Randolph can earn their medical office administration certificate online. The certificate program consists of 18 credits, including many that carry over to the 36-credit diploma program. Courses include introduction to computers; medical office procedures; medical office terms; and medical coding, billing, and insurance. Student can complete the certificate in two semesters by taking three courses in the fall and three in the spring. Randolph Community College is regionally accredited by Southern Association of Colleges and Schools Commission on Colleges (SACSCOC). As North Carolina's largest community college, Wake Technical enrolls 74,000 adults every year. Wake Tech students can take courses through six different campuses, three unique training centers, and various community learning sites around the state. Learners can also take classes online through Wake Tech's extensive distance learning program. Wake Tech offers more than 240 different programs of study, including associate degrees, diplomas, and certificates. The medical office professional certificate online program requires 18 credits. Students can complete all courses online, and some courses are offered on campus in a hybrid format. The curriculum features courses in keyboarding and word processing skills, medical office terms, medical insurance and billing, spreadsheets, and electronic health records. The certificate provides the skills students need for entry-level positions in medical offices and settings. The courses and credits in the Medical Office Professional Certificate program apply to both the diploma and AAS degrees. Originally known as Bladen Technical Institute, Bladen Community College offers 14 unique academic programs both on campus and online. Situated in Dublin, North Carolina, Bladen hosts college transfer programs, early college high school courses, adult education, and distance learning. Students can begin their degree at Bladen and seamlessly transfer to a four-year institution. Students interested in working for medical offices can earn their medical office administration certificate online. Students must have at least a high school diploma in order to begin the 18-credit certificate program. The diploma in medical office administration includes many of the same courses as the certificate program, including medical office terminology, medical billing and coding, and word processing. Bladen Community College is regionally accredited by the Southern Association of Colleges and Schools Commission on Colleges (SACSCOC). More than 35,000 students attend courses through the five campuses of Guilford Technical Community College, the fourth largest institution in North Carolina's community college system. Guilford offers more than 80 programs of study, including associate, diploma, and certificate options in areas such as accounting, dental hygiene, and medical assisting. Students can also attend classes at Guilford's Small Business Center. Students interested in earning their medical office administration certification online can enroll in Guilford's medical office administration billing and coding diploma program. The program prepares students for entry-level careers in medical billing and coding. Coursework emphasizes skills in writing, medical legal issues, and medical office terminology. The program requires 15 credits, and students generally complete the diploma in two semesters. Located in North Carolina, Fayetteville Technical Community College serves 16,000 students through six campuses and education centers. Students can pursue more than 250 unique programs of study, including occupational, transfer, technical, continuing, and general education programs. FTCC offers several fully online programs, including a medical coding specialist certification. The 18 credits required for this certification also apply toward FTCC's associate medical office professional degree. Students generally take three semesters to complete the certificate. The curriculum includes courses in medical office terminology, medical insurance and billing, and procedure coding. FTCC students can also take advantage of a career coach and job center to help find employment upon graduation. Fayetteville Technical Community College is regionally accredited by the Southern Association of Colleges and Schools Commission on Colleges (SACSCOC). Located less than an hour from Seattle, Washington, Green River Community College enrolls 8,000 students in 75 different programs of study. International students make up more than 1,700 of Green River's student body, representing more than 64 countries. All new students enjoy a trip to Seattle as part of orientation. Green River offers degrees, diplomas, and certificates in areas such as economics, computer science, and accounting. The school also provides transfer options to four-year universities. Green River offers three unique medical office administration certifications online: medical front office, medical office manager, and medical office support. All of these programs include hands-on learning and internship opportunities. Students may also earn credit for prior experience. The certificates require 54-59 quarter credits each, including coursework in medical office procedures, business correspondence, business math applications, and human relations. Green River Community College is regionally accredited by the Northwest Commission on Colleges and Universities (NWCCU). Based in Pueblo, Colorado, Pueblo Community College serves more than 7,000 students through three campuses and one high school learning site. PCC emphasizes open access and admits any college-ready student over 18. Students can pursue general, technical, and career education programs. In the last academic year, more than 400 graduates from PCC transferred to public four-year institutions in the state. The school confers associate degrees, diplomas, and certificates. PCC offers a medical office administration certificate online. The 27-credit program usually takes two or three semesters to complete. Courses emphasize skills in communication, project management, organization, and problem-solving. Credits earned in the certificate program can also contribute towards an associate degree in applied sciences with a concentration in office administration. The associate degree requires 68-78 credits. Pueblo Community College is regionally accredited by the Higher Learning Commission (HLC). The medical coding certificate program is accredited by the American Health Information Association. The list below details typical courses offered in medical office administration certificate online programs. While school curricula will differ, the classes below illustrate the training needed for competent office administration in the medical field. In this course, students learn composition and editing skills, improve keyboard dexterity, and improve familiarity with computer programs. Learners also work on proofreading skills in grammar, punctuation, and sentence structure. This course prepares students to compose memos and department emails independently. A typical program takes one year to complete as a full-time student, consisting of four or five courses per term and totaling 40-50 credits. Part-time students will require more time for program completion, between two and three years depending on the number of courses completed each term. Prior experience and prerequisites, such as skills in computer programs or coding, also affect program duration. For students with part-time or full-time employment restrictions, and family obligations, returning to school can be a big time commitment. The primary benefit of online education is flexibility. Online programs can lead to new career options or further current job positions. A medical office administration certificate online is different from a medical office administration diploma. A diploma has additional educational requirements and prepares graduates for higher levels of administration. A certificate benefits students who want to complete a degree quickly, while a degree requires two years of full-time enrollment. There are many job opportunities in healthcare for graduates with a medical office administration certification online. For students with strong interpersonal skills, an office administration or receptionist position allows you to build a rapport with incoming clients and their families. For detail-oriented students, an information technician position or transcriptionist job may be the right choice. As you consider future career options, keep in mind your natural skill set. Administrators meet incoming clients and gather personal information and medical histories. They schedule patient appointments, deliver test results, and maintain patient records. These technicians review patient records for accuracy and completeness, and digitize documents. They track patient outcomes, monitor quality assessments, and maintain patient confidentiality. These professionals translate a doctor's recorded or written documentation into a complete medical file. They review and edit dictation drafts, translate medical abbreviations, and troubleshoot inaccuracies or inconsistencies to maintain correct, detailed documentation. Clerks create reports, file claims, and organize bills or orders in a medical setting or for government and juridical administrations. They answer client or patient questions related to files or paperwork and maintain physical and digital records. Receptionists keep the epicenter of an institution or company operating smoothly by answering calls and connecting customers and clients with company professionals. They schedule appointments, maintain calendars, check-in visitors and incoming or outgoing postage to ensure productivity. A medical office administration online certificate qualifies you to work in healthcare facilities, or pursue further education and certifications. The following list details five associate and bachelor's programs related to an office administration certificate. Earning an associate or bachelor's degree significantly improves earning capacity. For example, medical and health services managers currently earn a median salary of $98,350, with a projected growth of 20%. This degree requires approximately twice the coursework of a certificate, and provides additional training on hospital and healthcare facility administration. There is also a focus on recordkeeping to qualify students for higher levels of management. For those interested in technological innovations in healthcare information technology, this associate degree addresses information documentation, organization, and security. This bachelor's degree allows professionals to enter higher administrative positions in healthcare immediately after graduation. Students learn composition and editing, an understanding of medical administration levels, and personal leadership skills. Learners study the psychosocial triggers behind substance abuse in this degree. Students learn the fundamentals of counseling and gain real-world experience in preparation for a career as a drug abuse specialist or patient counselor. Students interested in helping patients transition through difficult life changes can become a social worker. Social workers assist patients individually or in groups to improve quality of living and help with physical and psychological issues. Regardless of the level of education you choose to pursue, finding an accredited school is a valuable component of your degree. Accreditation means a school or program meets a standard of recognized excellence. Many employers and higher education programs require accreditation. The U.S. Department of Education (ED) sanctions six accrediting bodies to monitor and regulate schools. You can check a school's website for accreditation, or search for the school directly in the ED's database of accredited postsecondary institutions and programs. Online students can look for support from the Distance Education Accrediting Commission, a private, nonprofit monitoring system for online learning.